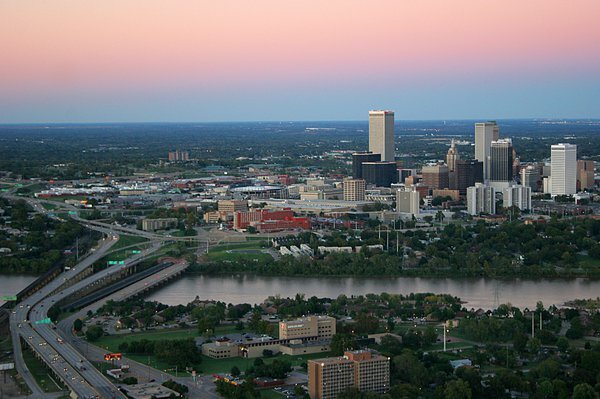 Tulsa contains plenty of districts with a range of activities, from live shows and restaurants to attractions and shopping options. Venture into the heart of Tulsa, Oklahoma’s second largest city, for a trip into a glimmering metropolis filled with world-class attractions, vibrant nightlife venues and exclusive shopping destinations that range from upscale to unique. Home to cosmopolitan delights coupled with Southern hospitality, Tulsa is a dynamic city known for a variety of bustling urban districts, exceptional dining, an unsurpassed love of the arts and one of the largest collections of art deco architecture in the nation. Immerse yourself in the rich cultural legacy of Tulsa’s renowned performing arts venues, and tap your toes in the birthplace of Western Swing while letting the sights and sounds of Tulsa tempt you into enchanting travels around the city. Start your adventure here with the top ten things to do in T-Town, and let the fun begin! Visit the Gathering Place, and discover why USA Today 10Best Readers' Choice named it America's Best New Attraction in 2019! At this Tulsa River Parks destinations, guests can choose from a variety of outdoor explorations, from a walk through the Four Seasons Garden to a kayak adventure at the ONEOK Boathouse. All ages are sure to have a blast at the Chapman Adventure Playground, with creative structures shaped like animals, castles and fruits. The Gathering Place also offers plenty of fitness activities like the SemGroup Sports Courts, skate park, Midland Valley & River Parks Trails, as well as an indoor cafe, outdoor patio and QuikTrip Great Lawn for live entertainment. Offering diverse recreation for pedestrians, cyclists, fishermen, disc-golfers and more, the full Tulsa River Parks system is an outdoor retreat along the banks of the winding Arkansas River. Bring your walking shoes for over 26 miles of asphalt trails, or rent a mountain bike, hybrid or tandem bicycle from Tom’s Rivertrail Bicycles and hit the trails while soaking in plenty of sun and fresh air. Descend into a slice of Oklahoma wilderness without leaving Tulsa by visiting the parks’ Turkey Mountain Urban Wilderness Area, which features 300 acres of dirt trails perfect for hiking, mountain biking or horseback riding. This 300-acre area of heavily-wooded, riverfront property also provides picture-perfect views of the downtown Tulsa skyline. With nine square blocks filled to the brim with trendy eateries, local pubs, indie boutiques and some of the best nightlife venues around, the Blue Dome Entertainment District is quickly becoming the place to be in Tulsa. Anchored by the famed Blue Dome, a revitalized 1920s-era Gulf Oil station, this downtown Tulsa district is serving up custom cocktails, stylish food and live entertainment any day of the week, all year long. Sashay your way into this hub of Tulsa’s nightlife scene, and listen as the hottest local bands turn up the amp and crank up the heat. Treat yourself to a stout Guinness draft at Arnie’s Bar or a rooftop margarita at El Guapo’s Mexican Cantina. Pair German cuisine with your favorite beer on tap at Fassler Hall, while favorite locales like Juniper Restaurant & Martini Lounge treat customers to lip-smacking entrees, smooth drinks and plenty of creative, Tulsa-grown charm. Dilly Diner serves up breakfast food favorites, while Andolini's Sliced creates five styles of pizza to satisfy cravings across the board. For an elegant dose of retail therapy, there is no shopping destination more fully equipped to fulfill your desires than Utica Square in Tulsa. Designed to satisfy the cravings of fashion fanatics and home décor fans everywhere, Utica Square features a wide range of upscale boutiques, specialty shops and time-honored department stores waiting to deck you out in designer duds, swanky shoes and posh purses. Let your designer dreams run wild in such industry heavyweights as Saks Fifth Avenue, Ann Taylor, Anthropologie and Coach. When the weight of filled shopping bags awakens your hunger, travel along the manicured outdoor avenues of Utica Square to one of the square’s exceptional bistros. Relax with a cup of freshly brewed Topeca coffee at Queenie’s, whet your appetite with stuffed Italian bread and crab cakes at The Wild Fork, or indulge your palate with French cuisine at the Stonehorse Café. At the end of the day, nothing says relaxation after a long day of shopping quite like a hot stone massage or soothing pedicure at Ihloff Salon & Day Spa. Recognized as home to one of the top 10 music scenes in the nation, Tulsa’s live music and historic entertainment venues know how to put on a show. Nab a ticket to the iconic Cain’s Ballroom and enjoy the energetic sounds of some of the biggest names in music today. Known as a top performance venue in Tulsa since the 1920s, the historic Cain’s Ballroom has played host to everything from Western swing to rock-n-roll, new wave and post punk. Tulsa’s Brady Theater, a 2,800-seat former vaudeville house, attracts diverse acts such as U2, Eddie Vedder, Deftones and Tenacious D, while the Tulsa Performing Arts Center interjects a level of sophistication with heart-stirring performances by the Tulsa Ballet, arts groups and international talent. Local artists grace the stage at Guthrie Green, while indie artists often stop through at The Vanguard. For everything from major concerts to family ice shows, grab a seat at the colossal BOK Center and hold on tight for a night of unsurpassed live entertainment. Enter a world filled with American Indian legend, frontier lore and the romance of the American West at the nationally celebrated Gilcrease Museum, only a short 10 minutes from downtown Tulsa, and celebrate the unique American experience with one of the world’s most comprehensive collections of Western art, artifacts, historical manuscripts, antique maps and more. Visitors to the Gilcrease are encouraged to wander through vast galleries filled with an astonishing 10,000 works of art including 18 of Frederic Remington’s 22 bronze sculptures, large-scale masterpieces of American landscape and an unrivaled anthropology collection. Discover the fascinating history of the Americas with the aid of interactive collections, and head outdoors to stroll through the museum’s 11 themed gardens. Get in on the action at Tulsa’s Hard Rock Hotel & Casino and enjoy the exhilaration of a jackpot-winning slot machine, the thrill of hitting 21 at a blackjack table, or the excitement of pulling a royal flush in front of poker’s greatest players. Spend time admiring the rock-n-roll memorabilia displayed around the 110,000 sq. ft. casino floor, and celebrate your winnings in style with a sleek VIP suite within the 19-story Hard Rock Hotel tower. Let your inner rock star shine with a night on the tiles at Riffs, the Hard Rock’s premier nightlife venue. Dance to the sounds of a live band performing on Tuesday, Thursday, Friday and Saturday nights, and enjoy cocktails and drinks with their premium service. Don’t miss a chance at hitting a hole-in-one on the back nine of the illustrious Cherokee Hills Golf Club located at the casino, and check out a variety of dining options, ranging from homestyle favorites at Toby Keith’s I Love This Bar & Grill and the Wild Potato Buffet, to fine dining coupled with outstanding views of the Tulsa skyline at McGill’s on 19. Gather up the kids and the rest of the family for a visit to the top-rated Tulsa Zoo and feast your eyes on African lions, Australian kangaroos, South American jaguars and Malayan tigers over 84 acres of wild exhibits. Take a ride around the zoo onboard the popular Safari Train and visit a variety of unforgettable exhibits that include state-of-the-art audio and visual displays, walk-through caves, interactive petting areas, sensory gardens, a recreated Massai village, pre-Colombian ruins and much more. Don’t leave the Tulsa Zoo without seeing the Giraffe Experience, Chimpanzee Connection, the African penguin exhibit, Lost Kingdom or the Helmerich Sea Lion Cove, which invites visitors to view these playful creatures from an underwater viewing station. Walk onto the lush grounds of the Philbrook Museum of Art in Tulsa for a taste of 1920s refinement and opulence. This prestigious museum of fine art is housed within the former 72-room mansion of Tulsa oilman Waite Phillips. The Philbrook Italianate villa is now considered the preeminent art center of Tulsa and welcomes visitors year-round to view its stunning permanent collections, delightful art exhibits and flawless garden landscapes. After touring the art pieces within the museum, step out onto the black terrace to see the symmetrical, living design work of the gardens, inspired by French, English and Italian designs. The gardens, which also include dramatic water features, reflecting pools, elaborate wrought-iron niches and the Westby Sculpture Walk, are scattered across 23 acres only three miles from downtown. Pick up the free audio tour for an extra treat during your visit. Let your imagination take you on a journey of epic proportions at the Tulsa Air and Space Museum & Planetarium, where Oklahoma’s rich aerospace heritage is brought to life with vintage airplane displays, interactive exhibits and a state-of-the-art planetarium. The 3D, 50-foot planetarium dome will take you from the skies above Tulsa to alien galaxies 70 million light years away, all while whipping past stars, planets and asteroids on your voyage skyward and beyond. Sit in a cockpit of a F-14A Tomcat fighter jet while humming the theme to Top Gun, test your flight skills in the pilot’s seat with realistic simulators, fly a scale airplane through a wind tunnel and maneuver robotic arms like astronauts in space. The possibilities for fun and adventure are endless at the Tulsa Air and Space Museum. Take home the perfect Oklahoma gift item at one of Tulsa’s well-known specialty shops. Spend time exploring the many businesses at The Boxyard, a shipping crate shopping development, from Okie Dokie, an indie boutique with Tulsa pride tees and Oklahoma-themed gifts, to small-batch ice cream made at Rose Rock Microcreamery. Travel a short distance to Tulsa’s Brookside District and visit Ida Red General Store for Cain’s Ballroom merchandise, Tulsa t-shirts, postcards, retro candy and one-of-a-kind Oklahoma items. Plan your visit to Ida Red’s just right and you’ll be rewarded with live music or a local art event. Found within the Deco District, Okie Crowe whips up batches of handmade soaps, sold among Oklahoma-made jewelry and gourmet MIO foods. Find more things to do, places to stay, great dining experiences and fun festivals in Tulsa and plan your visit now.